See this article as it originally appeared in TIME Magazine Europe. 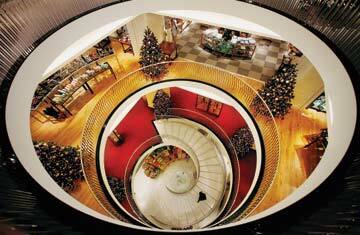 Since its inception in 1707, Fortnum & Mason has become the premier department store of the British élite. A browse through its six-floor building on Piccadilly in London’s West End shows why: there you can buy rose-petal jelly, a black leather Scrabble set or a $40,000 Christmas hamper containing a tin of beluga caviar and hand-engraved stationery — delivered by horse and carriage. Yet despite its flair for conspicuous consumption, F&M has struggled with “customer circulation,” says marketing director Alison Jordan. Many shoppers visit only during Christmas and Easter, and most never venture beyond the food hall on the ground floor. So to mark its 300th birthday this year, F&M embarked on a nearly $50 million renovation to highlight the store’s other luxurious departments. Its new crowning glory is a glass-domed central atrium, which spirals up from the expanded fresh-food stalls on the lower-ground level to the women’s clothing and beauty stands on the second floor. There you might splurge on a $2,600 Clive Christian “No.1” fragrance bottle, for instance, which flaunts a diamond solitaire. At the very least, the upper floors — where you can also buy designer motorcycle helmets and bejeweled calculators — offer a quiet refuge for shoppers keen to escape the bustle below. F&M’s hallmark, styled-to-perfection interior design was only enhanced in the refurbishment. Glittering chandeliers and intricate Christmas decorations help create an elegance unknown to department stores since the 1950s. That alone is worth a visit this holiday.